Gas grills up to about 50,000 btu/hr most often use low pressure propane which requires a low pressure propane regulator. Low pressure gas can be natural gas (natural gas normally does not require further pressure regulation), or propane piped into a trailer home or RV, or a conventional home in which the gas has already been adjusted to a 6 ounces (10.5 WC inches) low pressure at the propane source. Preset low pressure propane regulators and compact Twin Stage Regulators used in RV's and Mobile Homes are set at 6 ounces. We ship everywhere in the world...and the shipping is free to the 48 contiguous US states. How are the GasHosesandRegulators.com low pressure propane gas regulators any different than what is customarily sold at Home Depot, Lowe's, or from those included as original equipment with most gas grills? GasHosesandRegulators.com sells the M.B. Sturgis brand of low pressure regulators designed with 3/8" ID gas regulator outlets and 3/8" ID grey, AGA-approved gas hoses rather than the customary regulators with 1/4" ID gas outlets and with 1/4" ID black hoses. The 1/4" ID type are usually found on most backyard gas grills or are offered for sale at the Depots as replacement equipment. A larger gas regulator outlet ID of 3/8", going all the way from the regulator to the appliance permits an amazing increase in delivery of 2.25 times the VOLUME of gas to your appliance! These are preset regulators so you can't change the pressure, but you can change the volume of gas available to your appliance if it needs it. So, if you think your low pressure gas appliance is just not getting enough gas, the problem could be the diameter size of the regulator output and the hose delivering the gas. A regulator with a 3/8" ID diameter gas regulator outlet and a 3/8" ID grey hose is going to it make a lot more gas available to the appliance. Upgrade. Don't starve your grill of fuel! You still control the amount of gas used in the same manner, i.e., with the gas control knob on your appliance. (2) detecting excessive gas flow. ► 1 5/16" x 1/4" M NPT fitting size. propane regulators (our COM5 series regulators). ► We will install it on the regulator you order. No installation charges. ► Installation requires use of an 11/16" socket, preferably 6 point. We offer free shipping to 48 U.S. States. Wt. 2.7 oz. Why order a Green Acme tank fitting for your regulator? The Green Acme Type 1 tank fitting was made to tighten up clockwise using your hand into the propane tank without the requirement of using a wrench. It will screw into almost any standard propane tank except the very large 100# propane tanks. It was designed with a safety shut-off feature that is a thermally-sensitive sleeve which also will shut the gas off if it senses temperatures above 240°F or detecting excessive gas flow. MANC - Manual Tank Changeover Valve Assembly for Low Pressure with two 24" high pressure thermoplastic hoses and Green Acme Type-One wrench-less tank connectors with back flow prevention. POL tank connectors instead of the Green Acmes are available. This assembly will screw into ANY low pressure propane regulator. Valve is (2) 1/4" ID female inverted flare x 1/4" Male NPT. The Optional MANC-SS with two 24" high pressure thermoplastic hoses with a protective Stainless Steel Overbraid and Green Acme wrench-less tank connectors. The added feature of the Stainless Steel Overbraid makes the 24" hoses very strong and almost squirrel-proof. The changeover valve will assemble into any low pressure propane regulator. Using two propane tanks and one tank goes empty, just turn the yellow lever to the full tank. Close the tank valve and unscrew that Green Acme now you are free to remove the empty tank for replacement. A simple solution when running out of gas at the wrong time. approved gray AGA hose, with 3/8" Female SAE gas flare swivel fitting. Complies with UL144 and NFPA 1192 requirements for use with RV's. of 3/8" Female NPT. 160,000 btu/hr Maximum Output. We offer free shipping to 48 U.S. States. Wt. 7#. Tanks not included. Having an Automatic Changeover Regulator is one of the best solutions to avoid running out of gas. The regulator automatically switches from the empty propane tank to the full reserve tank, ensuring a continuous gas flow. The color of the dial changes from a highly visible green to red signaling that the first cylinder is exhausted while the valve automatically changes to the remaining full tank. Rotation of the handle to the full cylinder will restore the green color on the indicator. The built in safety back check permits one to change out the empty tank while the full tank is operational. gas flare swivel end fitting. permits to change out the empty tank while the full tank is operational. squirrels, you might want to consider the Stainless Steel Overbraid option. COM5 - 11" WC Low Pressure PRESET Regulator Assembly with a POL tank fitting and a 3/8" ID UL approved AGA hose, with 3/8" Female SAE gas flare swivel end fitting. ■ 160,000 btu/hr Maximum Output. ■ Green Acme Optional tank fitting is available at an additional charge. We offer free shipping to 48 U.S. States. Wt. 2#. (with a 5 ft hose). COM5-UL - 11" WC Low Pressure PRESET Regulator Assembly with a POL tank fitting, Ball Valve to control the gas and a 3/8" ID UL approved AGA hose, with 3/8" Female SAE gas flare swivel end fitting. with 3/8" Female SAE gas flare swivel end fitting. COM5-GRN-UL - 11" WC Low Pressure PRESET Regulator Assembly with a Green Acme Type 1 tank fitting, Ball Valve to control the gas, 3/8" ID UL approved AGA hose, with 3/8" Female SAE gas flare swivel end fitting. (2) 3/8" ID UL approved AGA hoses, each with 3/8" F SAE end fittings. We offer free shipping to 48 U.S. States. Wt. 3#. (with 5 ft hoses). COM5-D-GRN - 11" WC Low Pressure PRESET Regulator Assembly with a Green Acme Type 1 tank fitting, (2) Ball Valves to control the gas through each hose and (2) 3/8" ID UL approved AGA hoses, each with 3/8" Female SAE gas flare swivel end fittings. GR9450 - Compact Twin Stage (Dual Stage) Low Pressure Regulator, set at 11" WC. Gas Inlet is 1/4" Female NPT and the Gas Outlet is 1/2" Female NPT. 400,000 btu/hr Maximum Output. Dimensions: 7.5"L x 4.25"W x 3.25"H. Popular regulator for RV's. Includes mounting Z-brackets and a G-204051 Full Flow POL tank fitting, or a Red Acme, or MANC tank connector. The GR9450 is a combination of the First and Second stage regulators into a single unit. Starts with the First Stage which its preset at 10 PSI then it reduces down to the Second Stage which its preset at 11" WC but have an ajustment from 9" to 13" WC. The Gas Oulet is 1/2" Female NPT. 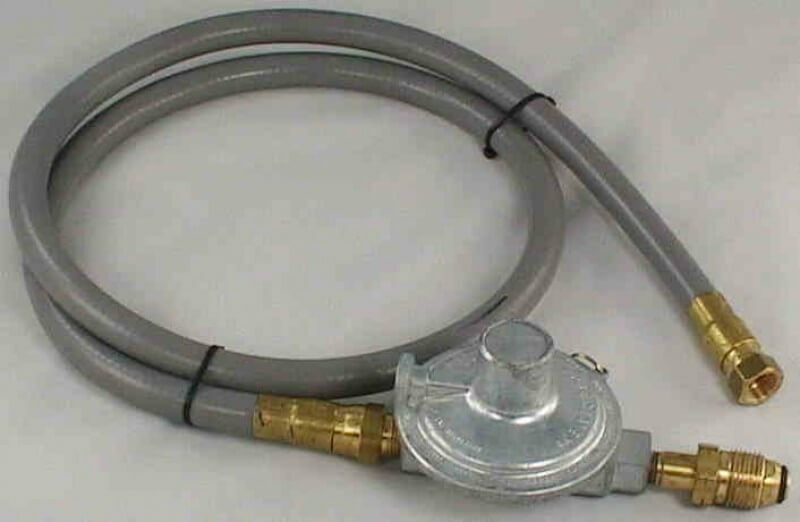 For a 1/2" ID Hose for the Outlet side of the regulator see our Natural Gas Hose webpage or the Replacement Hoses page. In most cases other regulators will not maintain this basic operating pressure in a very cold weather because the tank pressure been so low. This unique model will maintain 8.5" WC even in the very cold environment.Also very useful for small domestic applications requiring higher gas volumes than available from many normal low pressure preset regulators. Why use a twin stage regulator? The Twin Stage Regulator starts with the First Stage which reduces the unregulated tank pressure down to a preset 10 PSI. Then the Second Stage regulator will maintain a constant 11" WC pressure. Having a Twin Stage regulator will reduce the possibility of freeze-ups, which often occurs more frequently as the btu/hr demand increases. Also these units are mostly used in RV's to provide enough pressure for all the appliances and its required by Federal code on all RV's to have a Twin Stage Regulator. TS9413 - Twin Stage (Dual Stage) Low Pressure Regulator, set at 11" WC. Gas Inlet is 1/4" Female NPT and the Gas Outlet is 3/4" Female NPT. 525,000 btu/hr Maximum Output. Dimensions: 7.5"L x 5.5"W x 4.75"H. Popular regulator for food trucks. Includes a High Pressure hose with the length of your choice with a G-204051 Full Flow POL tank fitting and a TS900 mounting bracket. The TS9413 is a combination of the First and Second stage regulators into a single unit. Starts with the First Stage which its preset at 10 PSI then it reduces down to the Second Stage which its preset at 11" WC but have an ajustment from 9" to 13" WC. It's equipped with a built-in 1/8" Female NPT tap for a pressure gauge on the Inlet and Outlet. Gas Oulet 3/4" F NPT. For a 3/4" ID Hose for the Outlet side of the regulator see our Natural Gas Hose webpage. We offer free shipping to 48 U.S. States. Wt. 4#. (with a 5 ft hose). Add a MANC Valve Assembly to your shopping cart. TS900 - Mounting Bracket, for Twin Stage Regulators. since one is already included. Dimensions: 1.25" x 9". TS9209210 - First and Second Twin Stage Regulators, Mounted Integral Assembly. High BTU/HR output. ►Gas Inlet is a Female POL and the Gas Outlet is 3/4" Female NPT. ►The two regulators are pre-mounted on a 12" x 12" and 1/8" thick aluminum panel with 1/4" diameter holes in each corner for easy installation. We offer free shipping to 48 U.S. States. Wt. 11#. Why would someone want the First Stage and Second Stage Regulators pre-mounted and pre-plumbed on a panel? First Stage and Second Stage Assembly which is already plumbed together may be very useful for situations where you intend to have a portable propane tank close to the house or very near a propane fueled generator. For use with stand-alone, higher Kilowatt emergency generators which rely on larger volumes of propane from portable tanks. Also this Assembly will be for convenient for systems that need a higher pressure Btu's then the common regulators, sense this combination puts out 950,000 Btu/hr. SS920 - High Pressure Regulator, First Stage set at 10 PSI. Gas Inlet is: Female POL, Gas Outlet is: 1/2" Female NPT. 2,500,000 btu/hr Maximum Output. Dimensions: 8.75"L x 5.5"W x 4.75"H.
The SS920 is preset at 10 PSI but have an adjustment from 5 - 10 PSI. Equipped with an integral relief valve and a built-in 1/8" Female NPT tap for a pressure gauge. The Gas Inlet is a Female POL and the Gas Outlet is 1/2" Female NPT. It also includes a TS900 universal mounting bracket and a G-204051 Full Flow POL tank connector. Why use a First Stage and Second Stage Regulator Separately? When having a long distance from a large supply tank and the point of use of the gas, installation of the First Stage Regulator (high pressure) separately from the Second Stage (low pressure) Regulator will avoid pressure drops in the gas delivery downstream. SS9210 - Low Pressure Regulator, Second Stage set at 11" WC. Gas Inlet is 1/2" Female NPT and the Gas Outlet is 3/4" Female NPT. 950,000 btu/hr Maximum Output. Dimensions: 7.25"L x 5.5"W x 4.75"H.
The Second Stage Regulator is not designed to work directly to the tank pressure, needs to be used a First Stage Regulator. The SS9210 its preset at 11" WC but have an adjustment from 9" to 13" WC. It's equipped with an integral relief valve and a built-in 1/8" Female NPT tap for a pressure gauge. It has an Inlet of 1/2" Female NPT and the Outlet is 3/4" Female NPT. It also includes a TS900 universal mounting bracket. for WC (Water Column) with 1/8" Male NPT fitting. and is supplied with a 1/8" MNPT fitting. ► Dial face is 2.5". Height 4 3/8". fabricated with a beryllium copper diaphragm and a brass socket. It must be used correctly. Test gauges are not returnable. 1/8" FNPT test port outlets. We offer free shipping to 48 U.S. States. Wt. 4.6 oz. Our propane gas regulator specialists are here to help you. Call: 713.222.6095. We have a low pressure propane regulator for almost any situation.